Jamie Dimon’s management shake-up doesn’t just send a message to the bank’s employees and shareholders. The timing of the move – and the language in the announcement – serves as the JPMorgan chief executive’s response to the reignited debate over the structure of big financial institutions like his. Dimon lauded the idea of knitting JPMorgan’s parts together more tightly just as his former mentor Sandy Weill converted to the breakup cause. The JPMorgan reorganization has almost certainly been plotted for some time. But it’s also impossible to see the bank’s statements about “further unifying businesses around customer needs” and its “integrated approach” without reading into them a riposte to Weill’s arguments on Wednesday to separate commercial and investment banking from one another. It sure sounds like a raspberry from Dimon, whose working relationship with the modern Citigroup architect ended bitterly. The memo serves a broader purpose. It reveals the winners and losers among JPMorgan’s senior ranks. Investment bank boss Jes Staley looks the odd man out. He is to become chairman of the newly created wholesale bank that includes his division, treasury and securities services and the global corporate bank. It all but takes him out of the running to replace Dimon. Two longer-term candidates for the corner office are elevated. Matt Zames, who was parachuted in to clear up the chief investment office mess, adds co-chief operating officer to his roles. And Mike Cavanagh, the former finance chief and current head of TSS who oversaw the autopsy into the trading losses, becomes co-head of the wholesale bank with Daniel Pinto, a fixed-income boss. 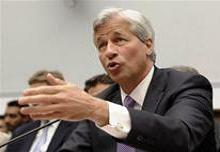 The reshuffle also suggests Dimon is getting dinged. It’s easy to read into the moves that JPMorgan’s board is pushing him to identify and promote successors sooner than he might have liked. That’s as it should be, though. All these internal machinations could be for naught. If universal banks aren’t allowed to remain in their current form, none of the jockeying lieutenants would get the chance to run the sprawling JPMorgan empire. But Dimon isn’t one to shrink from a fight. And he just made clear he’s ready to marshal his forces for the one being picked by his forerunners. JPMorgan Chase said on July 27 it is putting its investment bank, global corporate bank and treasury and securities services business together to form the corporate and investment bank. Mike Cavanagh, head of TSS, and Daniel Pinto, who runs the bank’s Europe, Middle East and Africa operations as well as being head of global fixed income, will be co-chief executives of the division. Jes Staley, CEO of the investment bank, will become chairman of the corporate and investment bank, remain on JPMorgan’s’s operating committee and lead a team investigating what the future of banking will look like. JPMorgan is also further integrating its consumer and community banking units. Todd Maclin and Gordon Smith are to become co-chief executives of the united group, with Maclin ceding the title to become chairman at the end of next year. JPMorgan’s mortgage business, currently overseen by Chief Administrative Officer Frank Bisignano, will be moved into the group early next year. Bisignano will become co-chief operating officer, a role to be shared with Matt Zames, who will retain his roles as head of the chief investment office and of mortgage capital markets.